Der Ampex 300 Recorder war der Nachfolger der 200A Bandmaschine und das erste wirklich erfolgreiche Ampex Produkt mit über 20.000 gebauten Geräten. Ran at 15/30 ips (strictly speaking, this was a Model 301) or 7.5/15 ips. Machines with serial numbers below 500 differed in many details from those that followed: top plate solenoids were AC; the top plate was plywood sandwiched between aluminum and stainless steel; there was no stiffening "banjo" under the top plate; the cabinets of the console-mounted machines looked like a miniature Model 200A cabinet. A great machine by any standard. Available up to four track on half-inch tape. It was the 300 transport that Ampex used to build up the then one-of-a-kind multi-channel recorder later sold to Les Paul. This was the standard studio mastering deck for decades. All the major studios owned them by the dozen. Most of the stereo Mercury Living Presence and RCA Living Stereo records were recorded on multi-channel Ampex 300s. Ampex made over 20,000 of these (Lindsay, op. cit., 41), including solid-state versions. (Anmerkung : Also die Geräte vorher hatten alle noch Röhren.) The main problem with the 300 transport is its indirect capstan drive. This design did not age gracefully: absolute speed accuracy was difficult to attain and flutter increased with wear. The 300 transport was more than nineteen inches wide; it had to be mounted vertically in a standard rack. The 300 transport was also the basis for the 3200 duplicator and various instrumentation decks. 300s with "bathtub" electronics lacked built-in microphone preamps. Anmerkung : Im Klartext, die ersten 500 Geräte der Serie 300 waren sehr unterschiedlich, eigentlich eine einzige große stetig verbesserte Vorserie. 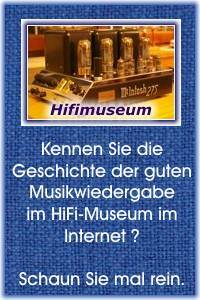 Aus der Erfahrung von anderen Produkten heißt das, es wurde zu diesem Zeitpunkt um 1949 und danach bei AMPEX immer noch wild experimentiert und gebastelt. Ampex Corporation introduced the model 300 multi-channel magnetic tape recorder in 1949. Early users of these machines concentrated primarily on the development of stereophonic recording techniques, but it was soon apparent, that multi-channel recorders were opening the way to a wide variety of other applications. During 1957, Ampex began to market the half-inch three channel model 300 recorders using high crosstalk rejection, cast-construction head assemblies. In the late 1960's, early 1970's, many older Ampex tape machines were being upgraded from tube-type to solid-state record/play electronics. Most upgrades were done using the latest MCI electronics. Recorded Distortion <.15% THD @ 200nW/m, <1% THD @ 6db above 200nW/m.